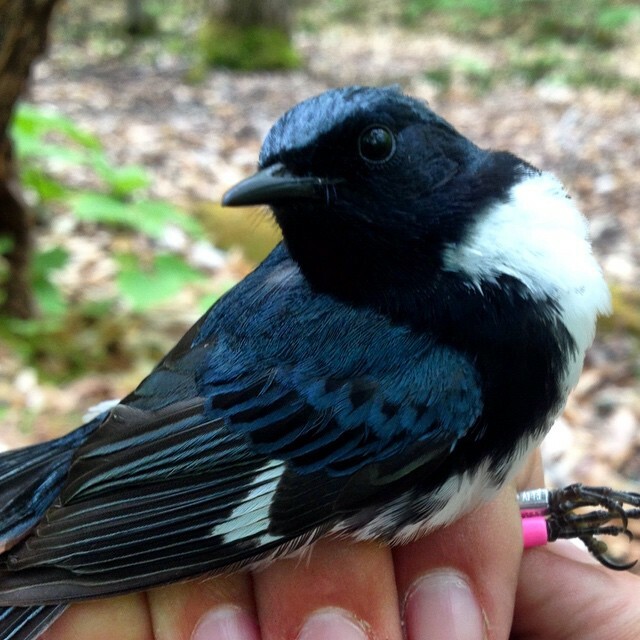 “I am going into the fourth year of my PhD studying maternal effects in black-throated blue warblers, small birds that live in mixed hardwood forests in the Eastern US. 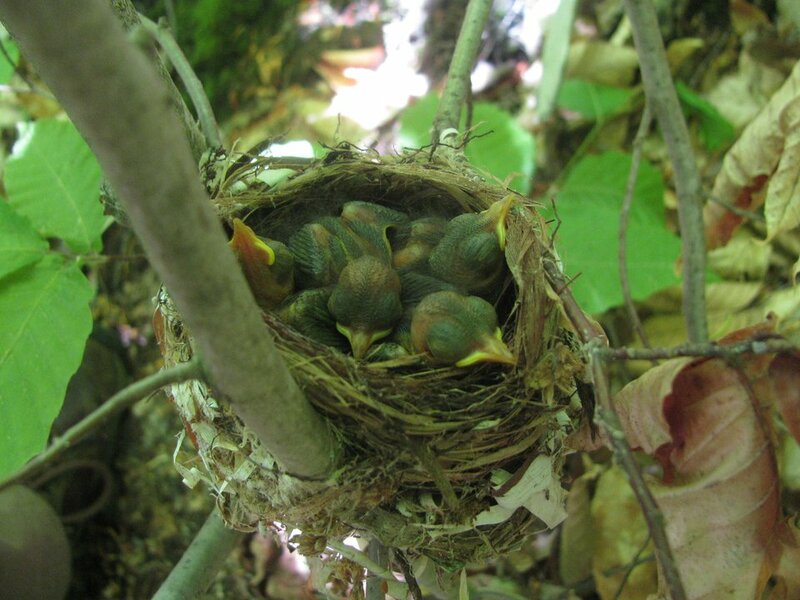 6 day-old Black Throated Blue Warblers. The young are fledged when they are only 9 days old. . They cannot fly yet, but they can give mighty hops that will soon turn into short flights. I love being submersed in nature. I have the opportunity to spend hours with individual birds, to see their personalities, their failures and triumphs, and undeniable persistence. Learning from the birds, and the forest is part of what keeps me moving in this direction. I also really like physiology, and my research lives at the intersection of ecology and physiology. The marriage of the two is most interesting to me on an intellectual level. Not surprisingly, females are understudied in almost all fields including ornithology and physiology. Studying female birds is my way of contributing to feminism. My workday begins at 5am, and I stay in the woods until 2pm. My days often involve being too hot or too cold, getting wet, and lots of bug bites! Tripping and falling down are part of an average day too; as looking at a bird instead of your feet can be hazardous. It is not uncommon to have days where I do not catch a bird or find a nest. I would say the vast majority of my time is spent just walking or standing still. I love “nest searching” because you have to be very in tune with each bird, and you can see how different individuals are from one another. 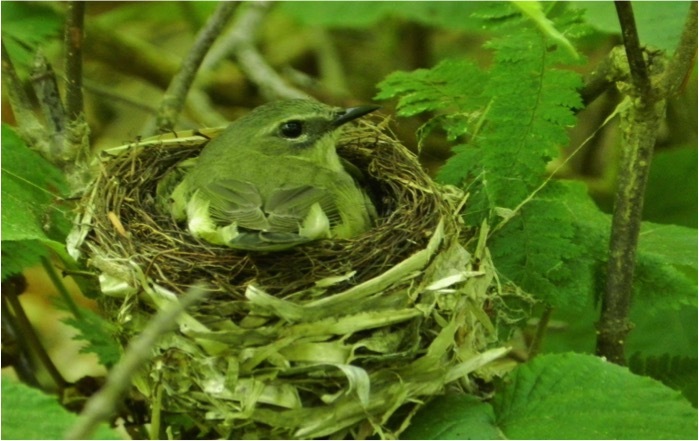 Finding a nest is always very special. Once we locate a nest, we continue to check in on it every other day. 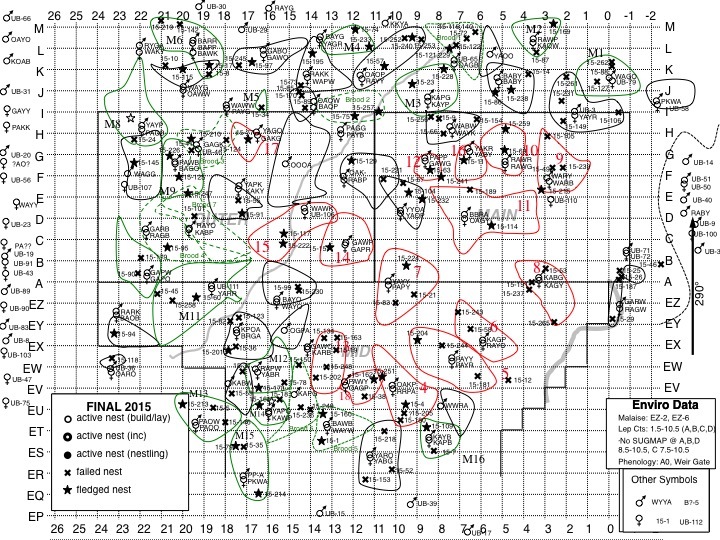 Each circle is a Black-Throated Blue Warbler territory. The red and black territories are control and green are experimental. The green territories have speakers that play predator sounds. We pick 15 red territories to focus on so that we make sure to follow at least 15 pairs through out the whole season. Each square is 50m by 50m, so the whole map is 1.1km by 1.3km. 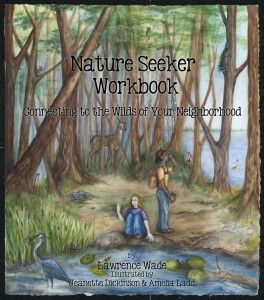 This entry was posted in Birds, Connecting to Nature, Nature Guardians, Nature Notes. Bookmark the permalink. It’s great to see these young people so invested in nature and have made their life path a part of it. What a delight to read Bird Woman of the Forrest, Nicole Krauss’s story. Never did I imagine what flexibility, sensitivity, and strength it would take to really study and learn from birds:-spending hours of days in the woods in all kinds of temperature and weather, -the challenges of data collection, peer supervision, nest hunting, while both teaching and taking classes, -being able to experience the unique personality of each bird, -and most surprising of all “studying female birds as a way of contributing to feminism.” Thank you, Nicole and Larry, for sharing this totally charming and impressive story. 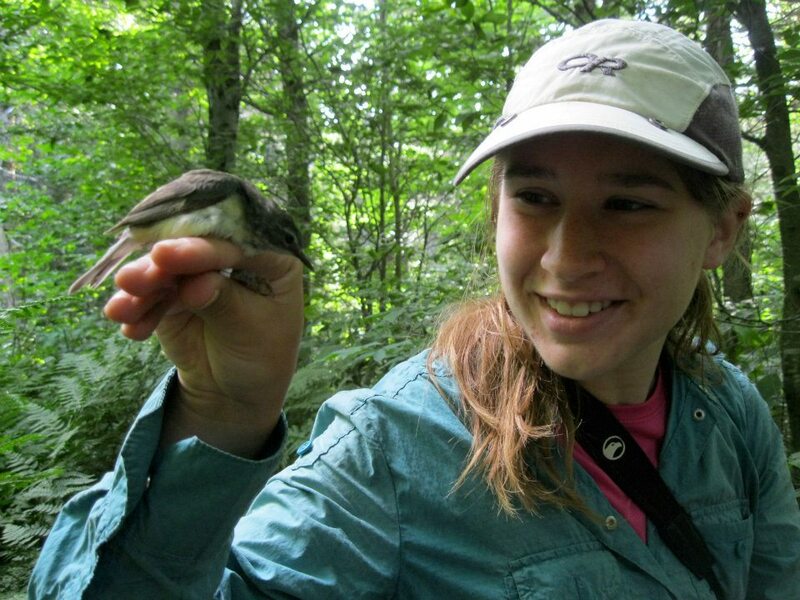 Naturalist News – Thank you for sharing this inspirational description of high school graduate Nicole Krauss and how a naturalist charts bird territories. Educational and uplifting in the same moment. Nicole has always had an affinity for everything in nature. As a child she was fortunate to have a personal relationship with Larry Wade who pointed out unique things, and shared his passion with her. She returns the passion, now. Although I am her mother, I always learn when I am with Nicole in a nature setting.